The Karoo is sometimes seen as simply a place to drive through on the way to or from somewhere, but in reality it is far more than that and well worth several dedicated trips. Far from being one uniform flat landscape, it changes so rapidly that we had to screech to a halt every few minutes – or so it seemed – to try to take photos of the variety of rocks, hidden plants and mountains, each which seemed to have its own personality. 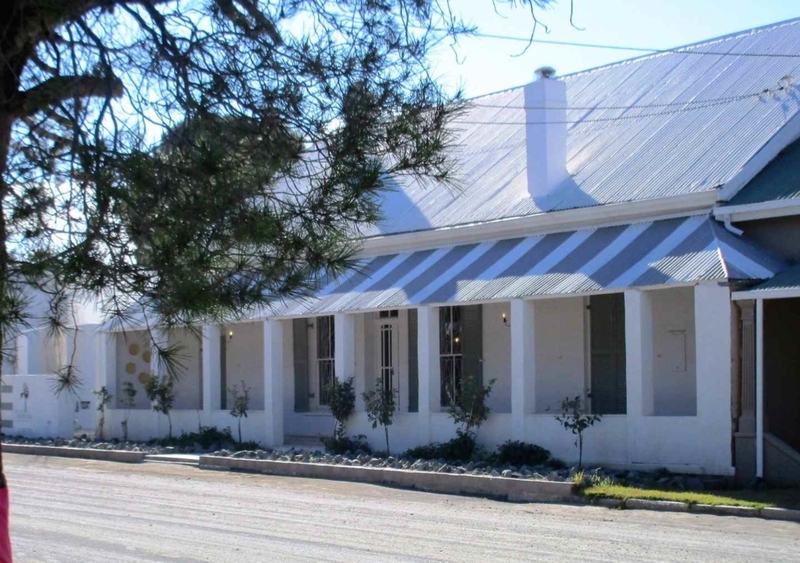 It was on leaving the Namakwa region of the Karoo that we headed to the actual Karoo and stopped off at Hanover for two nights at the Boutique Guesthouse Hanover. 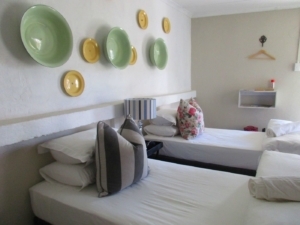 Hanover is close to the N1 so it is a popular overnight place, situated between De Aar and Middleburg. Hanover dates back to 1854 when the first plot was sold and has two things travellers expect to see – a house in which writer and feminist Olive Schreiner stayed, and an imposing Dutch Reformed Church. This one, as the town’s name hints at, has a German flavour. 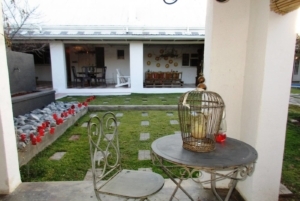 A charming aspect of the town is that residents with a verandah pay a stoep tax. 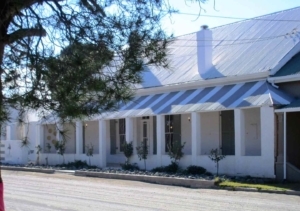 Like most Karoo towns, the houses front right onto the broad, quiet and carless streets. The story goes that residents didn’t have verandas at first, but when they became fashionable, they had to apply for permission to add these on to their houses. This was granted at a cost of one shilling a year, payable to the municipality and apparently a small fee is still paid. The broad open streets have a selection of guest houses and even a hotel from the early days of Hanover. We stayed at Boutique Guesthouse Hanover, a guest house with its own style, a kind of desert chic. My daughter and I had a twin room in a separate annex off the garden. The design motif was white, crisp and clean, with touches of colour in the cushions or the enamel plates arranged in a design on the wall. Other luxury touches included the coffee station, a bar fridge, air conditioning, satellite TV, soft fluffy towels in the bathroom with soaps, shampoos and conditioners. If like us you arrive on a Saturday night or Sunday, you will probably have to rely on your guest house for meals if you don’t bring your own. 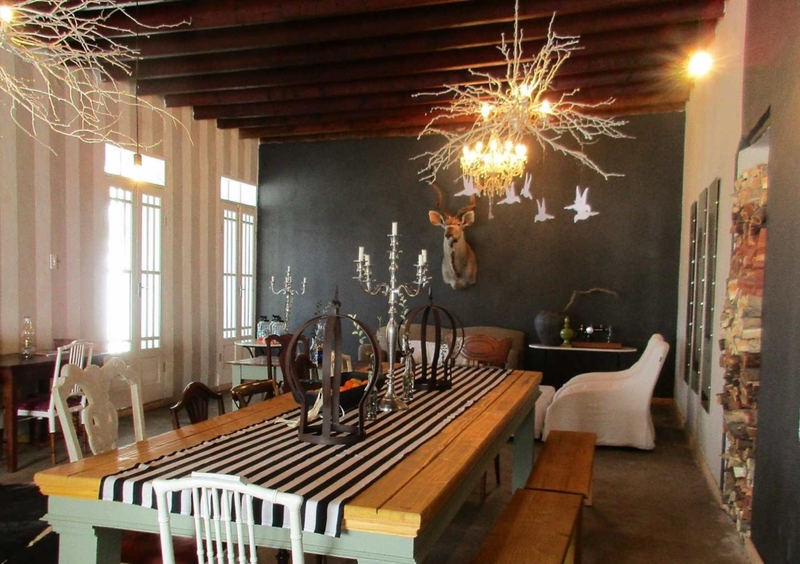 The Dutch owner and her staff are practised at making Karoo lamb and other guests were most appreciative of this. She also went out of her way to make vegetarian options, using vegetables from her own garden. There are several tables in the lounge-dining area for a bit of privacy at breakfast when you are still waking up and not feeling all that sociable, but supper is served at the big table with the owner adding her personal touch, chatting to the guests. The meals are served in the main lounge, which during our winter visit had a fire going so it was nice and toasty. Once again there was a whole lot of designer chic going on, with a display of a stuffed buck head, wood colour-coded and carefully arranged, striped walls and a collection of Dutch crockery. 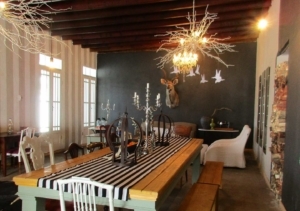 Find out more about Boutique Gueshouse Hanover and book a break in the lovely Karoo town of Hanover.